No,wait...Let me go back to the beginning. I've known the man that is now my husband for most of my life. We weren't high school sweethearts (those titles belong to two others), but we were high school friends. Once college came around, so did we, and we ended up falling for one another. A few years, a marriage and a baby made us a family. My husband grew up on a farm. He was athletic. He was the flirt. He was the good-looking one. I, on the other hand, was the shy girl. I was the gamer. I was an otaku. I was a writer. It happened gradually: making a gaming couple. Gaming was nothing new to my husband. He grew up around siblings that played. He would even try Golden Eye multiplayer once in a while, but those times were few and far between. Gaming never really mattered to him. At first, gaming was my hobby. I owned the consoles. I owned the games. It was my thing. But, as sometimes happens when you love someone, he took interest in what I was doing. I can remember playing Final Fantasy IX, in the midst of the move into our first house, and him starting to ask about what I was doing. He even sat and watched for a few minutes before going back to packing out belongings. But it was one particular game that really changed how he saw things. One Christmas Eve my husband handed me a present. We tend to not get each other gifts, so seeing how happy he was to give me this gift early was strange. 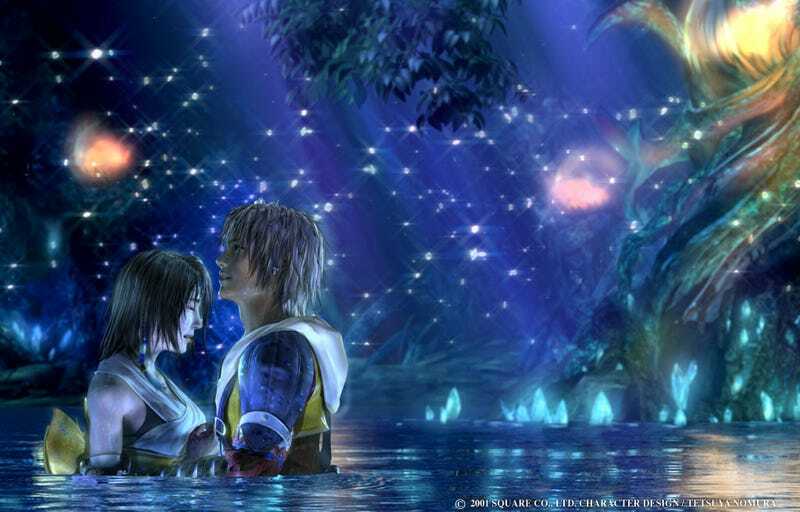 In the wrapping paper: Final Fantasy X. Of course, the first thing I did was start it. As we sat there watching the beginning, my husband sat beside me enthralled. I played until the wee hours of the morning, and as we finally went to bed, my husband joked that I couldn't play without him watching. My jaw must have fallen off from surprise. Never before had he seemed to care that much. What shocked me even more was a few weeks later, when he asked if he could start his own game. My husband never finished Final Fantasy X, but it turned out just to be the beginnings of his love with games. Next up was Hitman 2, and it was then that I learned how much I enjoyed watching others play. Hitman isn't something I would try, but watching my husband became as much fun as actually playing. I was the spotter. I was the internet secret hunter. I was actually vital to his progress, even though I wasn't the one with the controller in my hand. It opened a new world of gaming, even after 15 or so odd years. We both continued this way for a long time. He would watch or I would. And then came Borderlands. I've already written that post here, but it opened yet another world of gaming for us: playing together. Since then we have never gone more than a week without gaming together. It has become one of those things that bonds us. It's something we look forward to. In our crazy, busy lives, it had become something we set aside time for. It's what made us a true gaming couple.